2015 Jeep Wrangler Sahara with 33,000 miles. Hard Top with Automatic transmission well maintained and well taken care of, this Jeep looks and drives as good as new. We have a lot of Jeeps in our inventory please check us out. 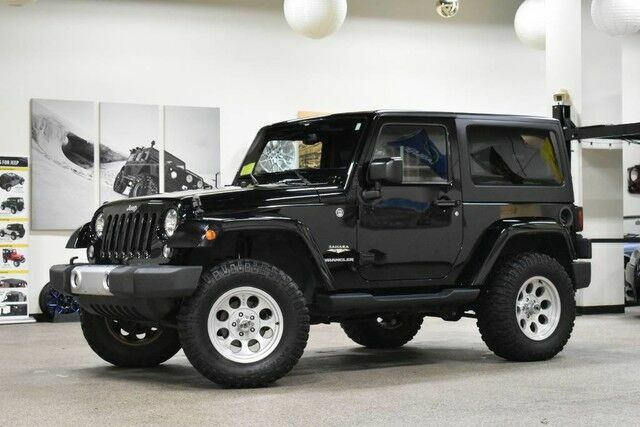 This Jeep includes: ENGINE: 3.6L V6 24V VVT (STD) V6 Cylinder Engine Gasoline Fuel ALPINE 9-SPEAKER W/ALL WEATHER SUBWOOFER Premium Sound System BLACK 3-PIECE HARD TOP Targa Roof Rear Defrost Convertible Hardtop BLACK, LEATHER TRIMMED BUCKET SEATS Heated Front Seat(s) Leather Seats Bucket Seats QUICK ORDER PACKAGE 24G REMOTE START SYSTEM Keyless Start Remote Engine Start TRANSMISSION: 5-SPEED AUTOMATIC (W5A580) 5-Speed A/T A/T RADIO: UCONNECT 430N CD/DVD/MP3/HDD/NAV Navigation System CD Player AM/FM Stereo Satellite Radio Auxiliary Audio Input Hard Disk Drive Media Storage MP3 Player CONNECTIVITY GROUP Tire Pressure Monitor *Note - For third party subscriptions or services, please contact the dealer for more information. * Drive home in your new pre-owned vehicle with the knowledge you're fully backed by the CARFAX Buyback Guarantee. With this exceptional SUV, you'll get "sport," "utility," and comfort.